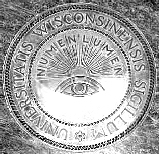 The University's first chancellor, John Lathrop, who assisted in the creation of the seal, described the interpretation of the logo: "The real meaning of 'lumen' is made perfectly clear by the eye and the rays. If in classical Latin 'numen' means a divine power manifested in any way, and if intellectual light comes from every direction to man, provided he looks up, then, to the believer in one God, the 'numen' which is light should mean the power of God manifest throughout the universe. 'Numen Lumen' then can be translated: "The divine within the Universe, however manifested, is my light". Further details via the University of Wisconsin knowledge base.